Beginning in 1873 the town of Pecos sprang up because of its ideal location on the Pecos River, which had only three areas that permitted wagons and stock to ford within 30 miles of the area. Pecos was designated as a strategic location for commerce and the distribution for ranching and overland transportation. The Butterfield Route, Chisholm Trail, and Goodnight-Loving Trail were among the cattle and wagon trains that traversed the Pecos. George A. Knight, who owned title to the section of land upon which the town was platted, offered the Texas and Pacific Railway a location for a depot and a gift of several town blocks. The railroad accepted his offer and built its tracks through the area in 1881. The Texas and Pacific Railroad connected the route between Fort Worth and El Paso, thus developing a ranching industry with substantial farming interests. 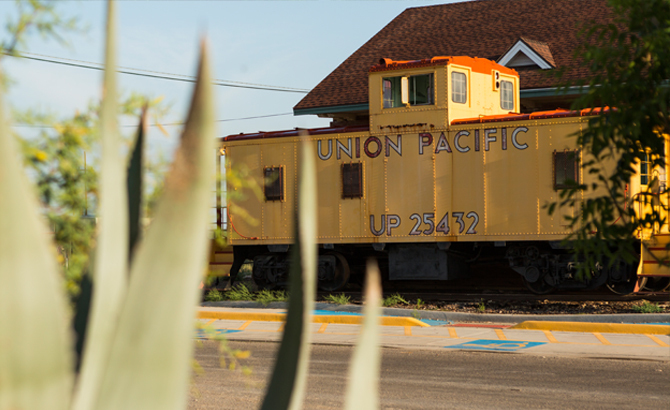 Sweet Pecos cantaloupe was served in the dining cars, bringing nationwide fame to the area. Today the restored train depot houses the Texas Rodeo Hall of Fame and the Pecos Area Chamber of Commerce.